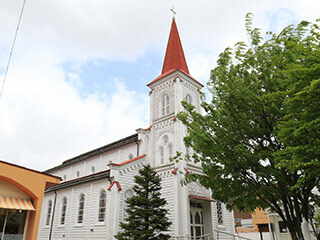 Tsuruoka Catholic Church (鶴岡カソリック教会) is located in Tsuruoka, Yamagata Prefecture. It was constructed in 1903 by Soma Tomitaro. French missionary Father Papineau designed the Romansque style building. Its basilica tile floor plan which has triple aisles and a polygonal apse is unique. There is no restroom or parking. It is the church, so please be quite and stay in a good manner. Do not disturb any activities of the church. The church building was reportedly designed by a French missionary, Father Papineau. It was actually constructed in 1903 by a master carpenter named Tomitaro Soma of Mikka-machi Tsuruoka. Its design is in the Romanesque style which originated in European medieval architecture. In 1973, this building was officially designated as a Yamagata Prefecture Cultural Treasure and later in 1979 as a National Cultural Assets. Some unique features of this building are seen its basilica type floor plan which has triple aisles and a polygonal apse. It's almost as if it were a copy of some medieval European cathedral.